So, how much smaller is it? It’s 5mm shorter and 5mm narrower (about 0.2″ on a side) and lighter too – 122g vs. 143g for the big One. The one thing that hasn’t changed is the thickness. The HTC One mini isn’t as compact as the Samsung Galaxy S4 mini (which is 8mm shorter than the One mini), but then it fits two stereo speakers on its front. What counts is that it’s tangibly more compact than the HTC One without sacrificing the premium build, which was the whole point. Let’s face it, even the big Galaxy S4 doesn’t feel as deluxe as the One mini. The screen on the HTC One mini is a 720p Super LCD 2 with Gorilla Glass 2. It’s much sharper than the qHD screen of the S4 mini – 342ppi vs. 256ppi – and has great viewing angles too. The two things we’re not sold on are the chipset (Snapdragon 400 is usually good, but HTC downclocked it to 1.4GHz) and the non-expandable 16GB storage (12GB user available). Anyway, here’s the quick hands-on video that shows off the HTC One mini and compares it to the big One. 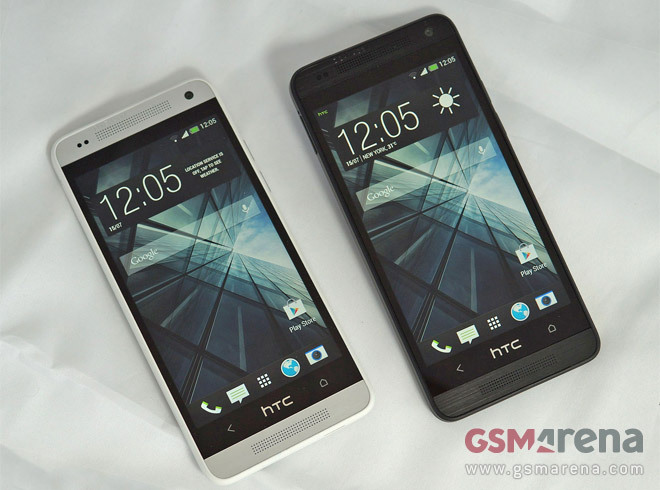 Be sure to check out our preview of the HTC One mini for more details.